I need to send out a big, huge, whopping THANK YOU to my darling little sister. Because if it weren’t for her…it probably would have taken me forever…and ever…and even then I possibly would have put it off…to haul myself out to the Indian restaurant that is consistently voted THE BEST in Louisville, Kentucky. Normally, I would rave and go on and sing praises for the Indian restaurant I have been going to since co-workers suggested it. That being Dakshin, also in Louisville. I love Dakshin…but after the experience I had at Shalimar…it is out and Shalimar rightfully is where I want to go for my Indian food cravings. Forever. And ever. Welcome to my Indian cuisine loving world, Shalimar. I have mentioned quite a few times how my family grew up eating Indian food. Authentic Indian food. Our neighbors, who had children the same age as my little sister and my older brother, often invited us over to dinner when they were having curry. And I loved it. All the different spices and flavors…it was exciting and exotic. It was…beyond delicious. I was hooked at a young age. So, as my sister’s husband isn’t as outgoing with food choices, when she told me she wanted to come visit me this past weekend, I wanted to get her to an Indian restaurant. Normally, I’d haul out to the far end of Louisville to Dakshin…but not this time. No way. I wanted to take her to the place that Louisville always seems to deem the best. This was a gamble…since I had never eaten there before. But…with those kinds of reviews and awards…how could it be a bad choice? I sent her the menu, although I knew that she’d be ordering the Chicken Curry…and comparing it to the stuff we grew up eating. The big day, Saturday, came. And after a fun day of walking around sight-seeing, shopping, and just having a good time, we decided we were starting to get a little hungry. 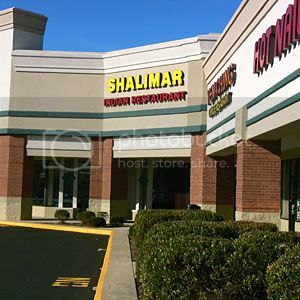 So…we headed over to Hurstbourne Lane to the strip mall where Shalimar is located. Two snags. First…traffic was ridiculous…so we ended up turning around and coming at the restaurant from another angle. By the time we got there and parked, we realized that the hours posted said dinner on the weekend was 5:30 p.m. We had about 40 minutes to kill. We hopped across the way to Half Price Books and just kept making circuits and looking at different books until we couldn’t take it anymore. Five minutes left…so we slowly meandered out of the store, got in the car, and headed back to the restaurant. They were now open and people were being seated. We were given a nice booth at the side of the dimly lit restaurant and allowed to peruse the menu. I had looked over the menu before, but was going go give it a little more of a look while we had the time. Our water glasses were filled and we were asked if we’d like anything else to drink. We all decided to stick with water. I had spotted something that sounded AMAZING on the menu…so I was now set. Cathy was still deciding…but finally settled. When our server returned…we placed our orders. Cathy went with the Lamb Biryani ($11.95), which is a classic Muglai dish of curried meats cooked with basmati rice. She made sure to specify that she wanted the spice on it as low as it could go. The less spice the better. Wimp. She also ordered a side of the Naan Bread ($1.95) to go with her meal. As predicted, my sister did order the Chicken Curry ($10.95), which is chicken that is cooked in a thick curry sauce. She opted for medium heat. She hoped it was as good as the Duggal’s. As for me…I went with the Broccoli Masala ($9.95), which might just be my new favorite thing in life. For real. This is simply broccoli cooked in spices. Except I ordered mine spicy! I always love some heat with my food…especially when it’s ethnic. And they promised they would do it up good for me. Orders in, we talked a lot about growing up with Indian food in our lives…and just having some fun. We took some selfies in the restaurant. And…soon…our food arrived. It all looked and smelled fantastic. I mean…really, really, really fantastic. I hated that I had pause to take pictures of my food for the blog because I was ready to dive in. My broccoli masala came with basmati rice, so after the photos were taken, I scooped up some rice onto my plate, then put some of the broccoli over it. Time to dig in. No joke. If I were to pick something to eat as my last meal…this is definitely one of the front runners. Honestly, there seem to be no words to properly describe how amazing this dish was. I know…some of you are thinking that it’s just broccoli and spices…but it was more than that. It was the perfect blend of spices…with the perfect heat level. In fact…I probably could have taken it a little spicier. The broccoli was tender and cooked to perfection. The sauce…the sauce made it. The rice gave me some oomph to the meal. And I was even happier when I added a tomato chutney to it. It was the perfect meal with the perfect people. For the record, the Chicken Curry brought back happy memories for my sister. Honestly. She was thrilled and said it totally reminded her of the stuff we grew up eating. And Cathy…loved her Lamb dish. She’s big on rice…and this was a big heaping pile of rice. For real. We were so happy with the food and service that we got at Shalimar. I don’t think I can bring myself to stray from this restaurant. This is where you go to get authentic, delicious Indian food. This is where you go to get the flavors, the tastes, and the experience of Indian cuisine. This…is why Louisville consistently names this restaurant THE BEST Indian cuisine in the city. In fact…I’m going back on Friday. Seriously. This entry was posted in Clean Eating, Entree, Food, Gluten-Free, Indian, Local, Restaurants, Review, Rice, Sauce, Vegan, Vegetables, Vegetarian by The Celiathlete. Bookmark the permalink.